For the first time, the detailed structure of the light harvesting material in recently discovered high performance dye sensitized solar cells (DSSCs) has been determined. There has been a strikingly rapid increase in the performance of solar cells based on methylammonium lead iodide (MAPbI3) perovskites following the first report in 2009; today greater than 15% power conversion efficiency has been achieved. A full understanding of these devices requires an atomic level understanding of the optically active material. 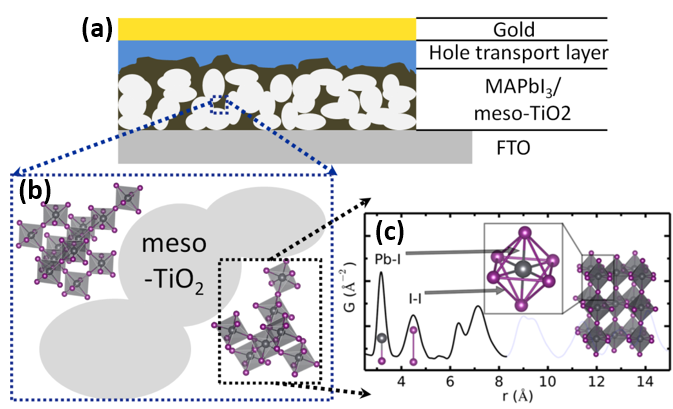 However, this is a major challenge because the active metal-organic perovskite is nanostructured and integrated into a mesoporous network of titania where the majority of the material present is the matrix oxide. It is notoriously difficult to determine the structure of nanomaterials in general, which are not amenable to crystallographic methods, but even more so when they are minority phases in a heterogeneous complex as in this case. Here we report the first fully quantitative structural characterization of mesoporous titania supported MAPbI3 using atomic pair distribution function (PDF) analysis of high energy X-ray diffraction data. Our pair distribution function analysis reveals a two component nanostructure: one component with medium range crystalline order (30 atomic %) and another with only local structural coherence (70 atomic %). The nanostructuring correlates with a blue-shift of the absorption onset and increases the photoluminescence. Our findings suggest that disordered and amorphous phases, which are not visible in conventional XRD measurements, are likely important to solar cell device efficiency, a factor that will depend on the processing method. They underscore the importance of fully characterizing and controlling the crystallinity in these devices.